Straight Boom Pickers - Encore Trucking & Transport Ltd.
We have a number of straight boom units in our fleet. These units are ideal for heavy and high loads such as air conditioning units, roofing materials, signs, poles, trusses, etc. We can accommodate man-basket work over 200′. 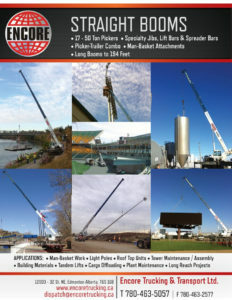 We also have jibs available for that extra reach when it is needed. These picker trucks are also equipped with 5th wheels, decks and pintle hitches giving them the ability to haul the loads they lift making them very versatile pieces of equipment.